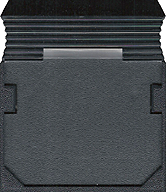 ColecoVision.dk presents: Bank Panic © 1984 by: Sanritsu Denki & 1985-1987 Sega Enterprises Ltd.
You've recently been recruited as the town's newest sheriff, but that shiny new badge of yours does nothing to scare away the crooks. ! The local bank is often the target of surprise bank robberies. to shoot the robbers as soon as they show their ugly faces. But be careful! Shoot a regular customer, get shot by a robber, or allow bombs to go off and you'll be out of a job faster than you can say "skedaddle." ! High Score For The ColecoVision Version Of: Bank Panic. 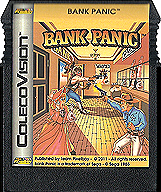 ColecoVision.dk Game # 90, Bank Panic is last updated: March 24, 2019.